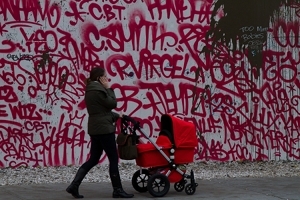 Too Many Babies: This amazing candid photo was taken in the Bowery in New York City. It appeared in a juried show last winter. 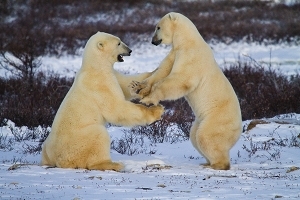 Dancing Polar Bears: This photo is part of a series taken in Churchill, Canada. It was exhibited at ABC Carpet & Home and in a juried show in Florida. My husband Michael received “Dancing Polar Bears” as a gift and adores it. Geothermal Rainbow: This one was taken at a Geothermal plant in Iceland. 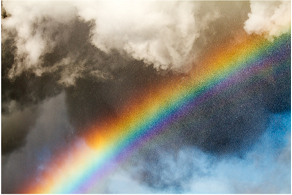 The rainbow was created by water drops captured as they were exploding! You can order these photos (prices start at $300) directly from Marge Neu’s website. Check out more of her photography here. Over the past ten years Marge Neu has nurtured and explored her life-long passion for photography with intense study and extensive travels to exotic locales. Neu has been fortunate to study with award winning photographers such as Jay Maisel, Vincent Versace and Seth Resnick, which has deepened her appreciation and skill in photography. Neu’s work featuring Maasai, Vietnamese children, New York street scenes, and the Churchill Polar Bears have been exhibited in juried shows at the Palm Beach Photographic Centre, in Palm Beach Florida. Last winter ABC Home in New York City featured a selection of her polar bear pictures from Churchill, Canada. Most recent work showcases the wonderful nature of Iceland. In addition to fine arts photography, Neu captures children in a very natural manner, recognizing that each photo is a unique moment. “A photo is an everlasting moment in time to be savored because the moments are all we have.” Marge Neu’s photography is the embodiment of these savored moments.